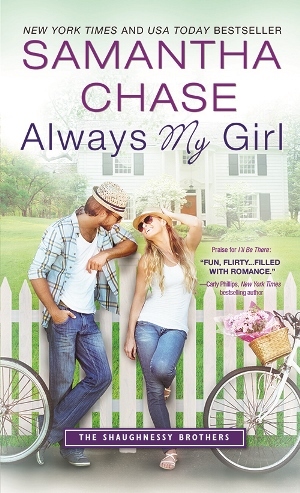 With ALWAYS MY GIRL, Ms. Chase takes a very simple and common story-line and adds on emotion, history and so much more to make it very engaging without compromising on the sweetness that we have come to expect from her. Friends-to-lovers romances are among my top five favorites so I have been bidding my time until this book since the first mention of this couple in previous books. Anna Hannigan and Quinn Shaughnessy have been best friends since Anna’s family moved in next door to Quinn’s, but while Anna’s affection for Quinn grew into love, Quinn never saw her as anything but his best friend. Until the day he really looked and realized that his tomboy best friend had become a very attractive woman. Anna is tired of waiting for Quinn and has decided to move on, but apparently all she needed to get Quinn to notice her was to change jobs and glam it up a bit because he’s gone all caveman and territorial on her. I’ll say that it took me some time to warm up to Quinn because he came across as a jackass and was very self-centered in the beginning. I was poised to write him off, until I saw that he was just a clueless man on so many levels, not that his selfishness is excused in any way. He’s an all or nothing person and doesn’t do well with obstacles. He would rather quit when the going gets tough than hang in there, but that attitude does not get you the girl, a lesson he really needed to learn. Anna on the other was a likable character – an endearing mix of independence and insecurity, strong in everything but a pushover when it came to Quinn. Between her and Quinn, my patience was severely tested, but I love that they got it together in the end. A favorite part of this book for me is keeping up with the changes in the lives of the other siblings, especially the previous couples as they take their relationships to the next level. Overall, this is a cute and heartwarming story and a welcome addition to the series. New York Times and USA Today Bestseller/contemporary romance writer Samantha Chase released her debut novel, Jordan's Return, in November 2011. Although she waited until she was in her 40's to publish for the first time, writing has been a lifelong passion. Her motivation to take that step was her students: teaching creative writing to elementary age students all the way up through high school and encouraging those students to follow their writing dreams gave Samantha the confidence to take that step as well.When she's not working on a new story, she spends her time reading contemporary romances, playing way too many games of Scrabble or Solitaire on Facebook and spending time with her husband of 25 years and their two sons in North Carolina.